Ever since the professionalization of the nonprofit sector that took place 30 years ago, nonprofit executive salary has been influenced by business compensation concepts—but for-profit pay practices cannot be indiscriminately applied to nonprofits. So what really powers executive pay in the sector? As it turns out, size does matter. What assumptions lurk behind public attitudes about nonprofit pay? A discussion between Jon Pratt and Paul Light from the NPQ archives illuminates the landscape. What drives successful volunteer mobilization, and is it time for a reevaluation of the powerful potential of volunteers in and around your organization? We are apt to praise the entrepreneurial spirit, but entrepreneurship is not automatically tied to success—a fact that has not stopped proponents from prescribing it as a cure-all for our sector’s woes, and which may have blinded some to the very real challenges that await those eager to put the concept into practice. Until the value of social entrepreneurship has been empirically assessed and established, it would be wise to proceed with care. 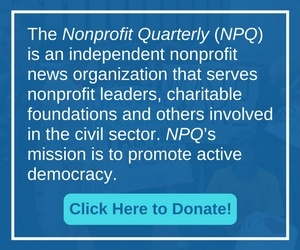 Welcome to the summer 2011 edition of NPQ! This issue covers topics having to do with the nonprofit sector’s workforce—and our workforce is different from the other sectors in a number of ways. . . .
How do you determine if your board has a conflict of interest, and how can you ensure its practices pass the “smell test”? Fundraising Education: A Fork in the Road?